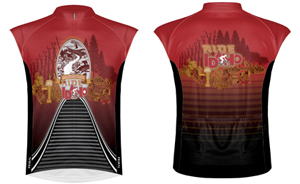 Ride Idaho's 14th Year Jersey has clean lines and features the 2018 route. The sophisticated look will make it THE jersey you reach for time and time again. After numerous requests, we opted to order all jersey’s this year, with the exception of the Gemini, with a full zipper. Plaited double-knit fabric with 2-way mechanical stretch has a push/pull effect which draws moisture from the surface of the skin and pushes it off the face of the jersey to keep you cool and dry. Offers a multi-sport functionality and superior comfort. 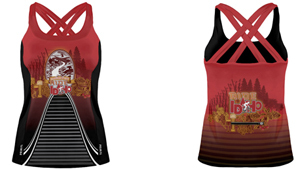 Each year we design a jersey that depicts in some way the location of that year’s route. Our jersey manufacturer requires a 10 week lead time for orders and this year we will be placing our order by April 15th to guarantee we will have them available for the start of the ride. 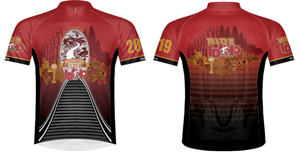 If you are considering ordering a jersey for yourself or a friend, we highly recommend you do so at the time of registration or if not by April 10th as we typically only order what has been presold and a few extras. Jerseys will be picked up at orientation and packet pickup. If we have enough requests to reach our minimum reorder number, we will place an order after the ride realizing a 10 week delivery time. This year’s jersey has a very unique design at $65 it is a great memorabilia.